With a stay at Oceanic in Durban (North Beach), you'll be within a 10-minute drive of Sahara Stadium Kingsmead and uShaka Marine World. Featured amenities include dry cleaning/laundry services, a 24-hour front desk, and an elevator (lift). Event facilities at this hotel consist of a conference center and a meeting room. Self parking (subject to charges) is available onsite. 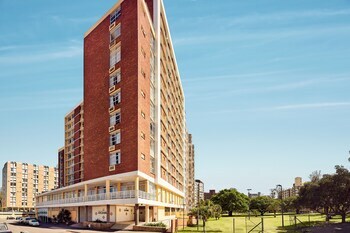 When you stay at Unique House in Boksburg, you'll be within a 10-minute drive of K90 Shopping Centre and East Rand Mall. Free self parking is available onsite. Located in Kimberley, Oak Rest Guesthouse is a 4-minute drive from De Beers Diamond Oval and 8 minutes from Kimberley Mine Museum Village. Free self parking is available onsite. Located in De Kelders, Cliff Lodge - Guest House is by the ocean, within a 15-minute drive of Grootbos Nature Reserve and Gansbaai Harbor. Free self parking is available onsite. With a stay at Saldanha Bay Vintour in Saldanha, you'll be 10.9 mi (17.5 km) from Calypso Beach and 13.9 mi (22.3 km) from Langebaan Beach. With a stay at Strathmore Manor in Cape Town (Camps Bay), you'll be convenient to Camps Bay Beach and Table Mountain. Free self parking is available onsite.